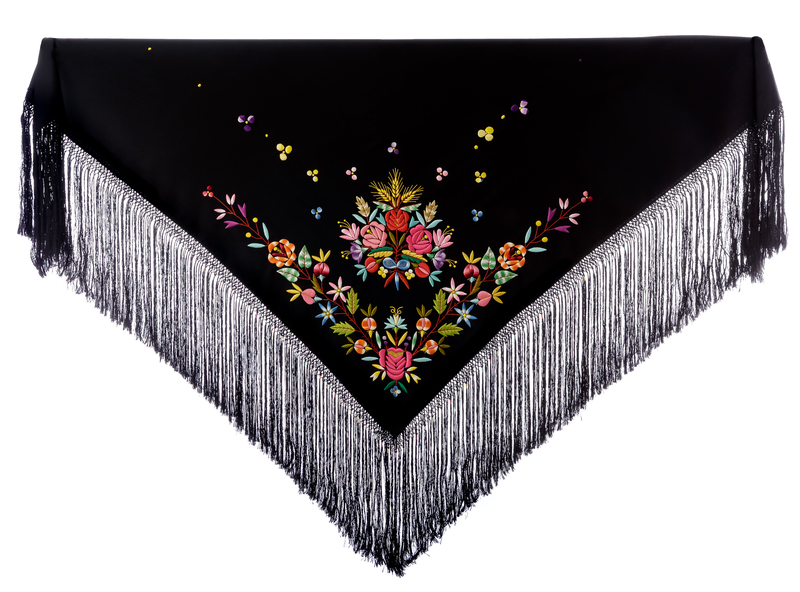 This elegant black shawl in fine tibet wool features a lively floral decoration embroidered, in a graceful angular composition and a delicate chromatic choice of silk yarns. Inspired by the traditional Sardinian costume for women, the small silk ribbon rosette was once applied to the bustier as an element to distinguish wealthy families. 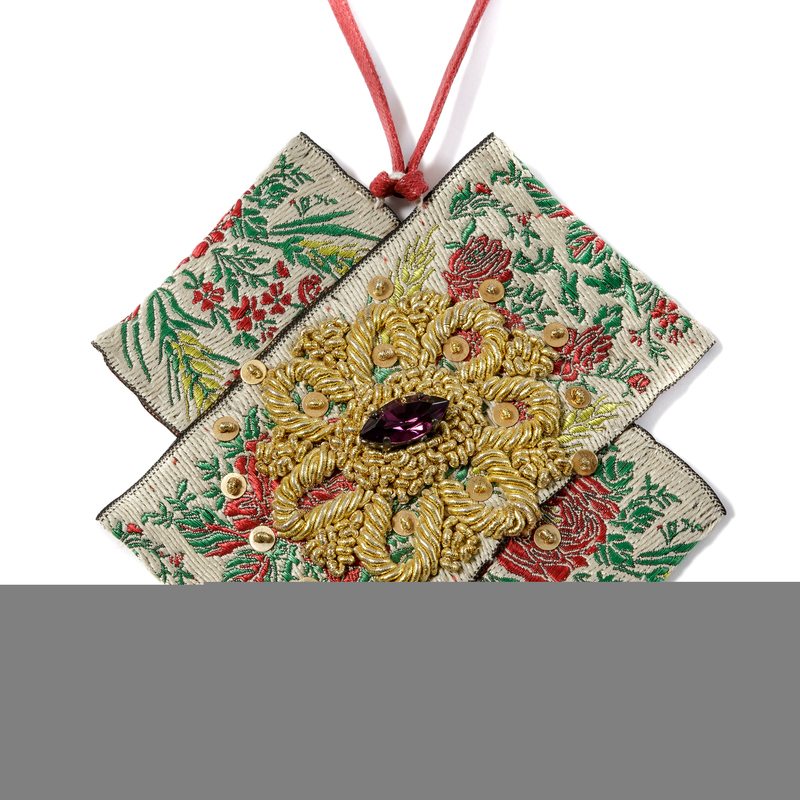 Reinterpreted with contemporary taste, the pendant of this original necklace is finely embroidered with gold and silver threads. 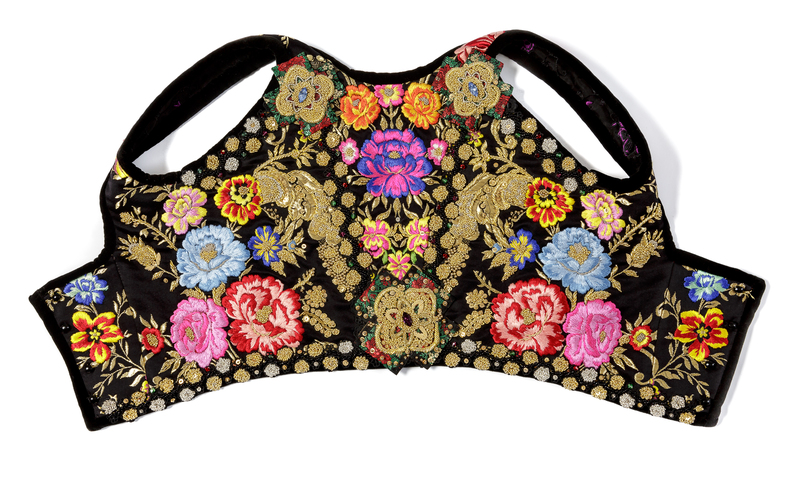 This short and close-fitting bodice in antique black silk fabric typical of the traditional costume for women is hand-tailored and richly embroidered in silk, gold and silver. 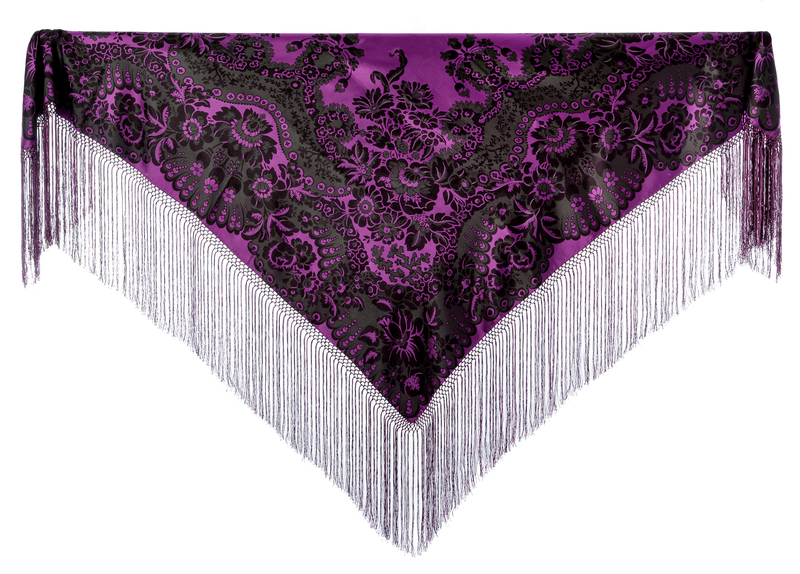 This large spectacular shawl draws on the local tradition in the recognisable choice of damask fabric with large lace patterns and black flowers on a purple background, finely finished with a long macramé knotted fringe in two colours. The saddlebag used on special occasions, typical of Sardinian tradition, is revived with evocative aesthetic fidelity in this version in loom-woven fabric with finely embroidered well-wishing motifs of the vine leaf with small bunches of grapes. Rita Cossu's accurate production reveals the in-depth research and wise knowledge of the uses and traditions of a fascinating past. Naturally talented and with a passion for sewing and embroidery since childhood, her successful career began in 1986 in Pabillonis, a village in the Campidano area near Cagliari, where she set up her sartorial business, which initially focused on tailoring refined and complex wedding dresses. However, what piqued her imagination, thus inspiring her production, was the captivating and colourful traditional Sardinian costume, characterised by the variety of styles and the use of particular fabrics that are the hallmark of each town or village. During the years of stylistic research and professional experience, Rita Cossu formed her own professional trait, which has become a reference point on the island for the production of traditional costumes that she crafts with the utmost precision, in the pursuit of the most authentic styles and carefully selecting the materials: brocades, velvets, orbace woollen fabric and silk threads with gold and silver filigree characterise her striking artefacts of remarkable cultural coherence. She has been working in her workshop, which is located in the evocative Casa Museo (Museum House) in the historic centre of Pabillonis for several years, where precious historical clothing and dowry items, as well as her creations, are clearly described by her invaluable explanations that help to keep ancient traditions alive. Her work can be admired also during production. 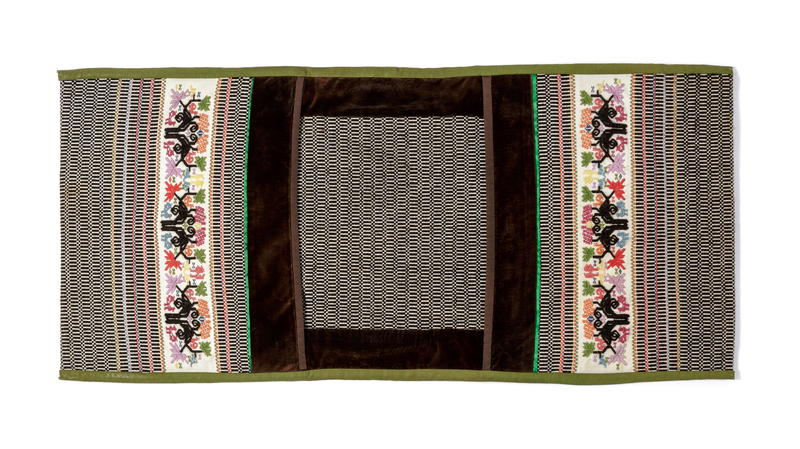 She successfully participates in the major local and international handicraft fairs. The collection by Sartoria Rita Cossu is characterised by the careful creation of garments typical of the traditional Sardinian costumes. A master embroiderer and tailor, Rita Cossu produces a wide-ranging collection of clothing items for both men and women, that faithfully reproduce the unique features typical of each village. From the finely embroidered linen shirts to the most complex pleated skirts and striking black wool tibet shawls with long macramé fringes and rich floral polychrome embroidery, each garment is individually crafted down to the smallest of details with the utmost precision. Hand-embroidered sacred vestments with gold and silver bugle beads also characterise a rich ecclesiastical sartorial production. Building on tradition, Rita Cossu interprets styles and fabrics in a new key in order to create original contemporary and tailor-made garments for men and women, as well as a prized collection of wedding dresses. All the creations of this tailor-shop are handcrafted, starting from the preliminary and tailor-made study of the model, followed by the careful cutting and tailoring phases. Different and fine embroidery techniques are used on linen, cotton and silk satin fabrics. The sophisticated polychrome embroidery and refined embroidery with gold and silver bugle beads stand out for their striking aesthetics, which reveal Rita Cossu's skill and mastery.